Less is more: WW3? It's just not shocking anymore. It's unnerving to see all the 'hot' spots around these days for the possibility of another world war. Have to admire the North Korean candor though...this dog might bite after it barks. Guess we will have to sit out another suspenseful media event threating the existence of life as we know it. But along side of climate change, nuclear war in the mideast or between India/Pakistan, famine and water shortage, financial collapse, global pandemics, meteoric collision, etc. ; does one more threat really shock us anymore? North Korea says it has put its military on full combat alert in advance of a big military exercise by US and South Korean forces. The official news agency called the manoeuvres a dangerous provocation. North Korea has warned that any attempt to shoot down a satellite it says it plans to launch will result in war. The South and the US believe Pyongyang could be preparing to test-fire a long-range missile under the guise of a satellite launch. On Friday, the North said that the risk of conflict meant it could no longer guarantee the safety of commercial flights through airspace it controls off the east coast. A number of airlines have already re-routed their flights as a precaution. 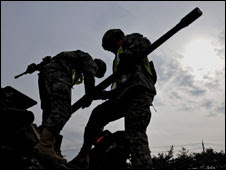 In a statement published by the official Korean Central News Agency on Monday, the Korean People's Army warned that it was ready to use force against the South, the US and Japan. "We will retaliate any act of intercepting our satellite for peaceful purposes with prompt counter strikes by the most powerful military means," it said. "Shooting our satellite for peaceful purposes will precisely mean a war." The army earlier issued a separate statement saying all military personnel had been ordered "to be fully combat ready" in order to defend the nation. It described the joint military exercise as "unprecedented in the number of the aggressor forces involved and in their duration". The army added that it would cut off North-South military communications during the exercise period. The 12-day military exercise involves about 50,000 US and South Korean troops, in what the two allies say is a rehearsal for the defence of the peninsula, the BBC's John Sudworth in Seoul says. But North Korea is always rankled by the annual drill, our correspondent says, claiming that it is a dry run for an invasion and dangerously provocative. Some observers in South Korea, though, believe the North may be using the exercise as a pretext to clear the skies, our correspondent adds. It announced recently that it was in the advanced stages of preparation for a satellite launch, something that both Washington and Seoul believe will, in reality, be a cover for a long-range missile test, he concludes. Last week, North Korea raised objections to the annual exercise at a rare meeting between its generals and the US-led United Nations Command (UNC) in the South. Tensions have risen since South Korea's President Lee Myung-bak began taking a harder line approach to the North on taking office a year ago. On 30 January, Pyongyang scrapped a series of peace agreements with the South over Seoul's decision to link bilateral aid to progress on denuclearisation. Six-nation talks on the aid-for-disarmament deal have stalled.